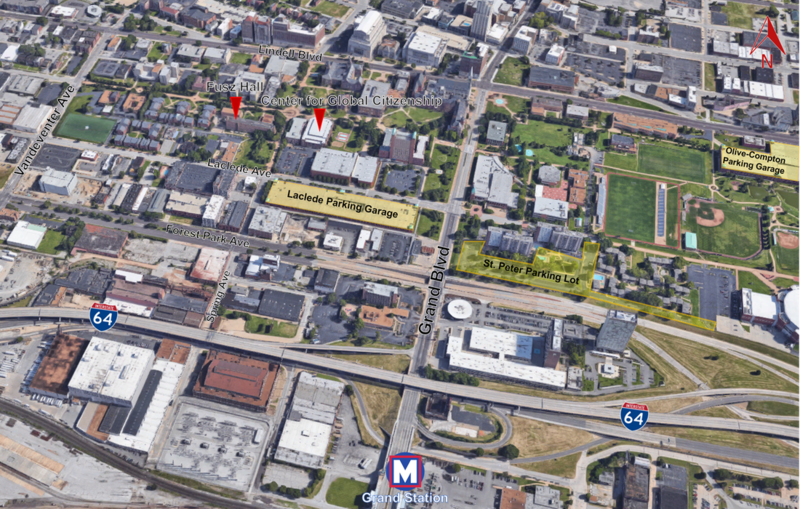 Arriving by car: Saint Louis University is located off I-64. When traveling Eastbound or Westbound on I-64: take the Grand Blvd. Exit. Turn right (north) onto Grand Ave. Turn right (East) onto Laclede Ave. Immediately turn right into the St. Peter Parking Lot for temporary parking while you register, pick up your parking pass and collect your room key. Registration is located in the Center for Global Citizenship (CGC) . Parking passes and room keys are located in the lobby of Fusz Hall. On Campus: Registration and the book exhibit will be held in the Center for Global Citizenship (CGC). To reach the CGC from the Laclede Parking Garage, head west (left) down Laclede Avenue. Take a right at Spring Avenue to head into the heart of Saint Louis University's campus. When you reach the clock tower, take a right and the CGC will be immediately on your right. Coffee will be available all day in the CGC. To reach the CGC from the Student Village Apartments, head east (right) down the center of campus. The CGC is past the clocktower, on the left. Arriving after hours: For those staying on campus but arriving after the registration desk has closed in the Center for Global Citizenship (CGC), please go to Fusz Hall (located 250 feet West of the CGC) where a night attendant will give you the keys to your room. In the morning, please check in at the CGC to receive your name badge and other conference materials. Day Parking: The preferred locations for daytime parking are the Laclede Garage (located on Laclede Avenue, between North Grand Boulevard and Spring Avenue) and the Olive-Compton Garage (entrance at the corner of Olive Street and North Compton Avenue). Over-night Parking: On-campus over-night parking passes may be purchased, in advance only, for $32. Parking passes are valid for either for the Laclede Garage between Grand Boulevard and Spring Avenue on Laclede Avenue (for those staying in the Village Apartments). Those who neglect to pre-purchase a parking pass but require overnight parking may do so in the Olive-Compton Garage (at the corner of Olive Street and N Compton Avenue) for $6 per day or per exit. All other visitors may use the Laclede Garage.